If a man has character, everyone has confidence in him. Soldiers must have confidence in their leader. Armistice Day speech (11 November 1948), published in Omar Bradley's Collected Writings, Volume 1 (1967). Testimony before the Senate Committees on Armed Services and Foreign Relations (15 May 1951), published in Military Situation in the Far East, hearings, 82d Congress, 1st session, part 2 (1951), p. 732. We are dealing with [veterans], not procedures; with their problems, not ours. On military character, in 19 Stars : A Study in Military Character and Leadership (1981) by Edgar F. Puryear Jr.
To those soldiers who must have often wondered WHY they were going where they did. Perhaps this will help answer their questions. To those soldiers who must often have wondered WHY they were going where they did. Perhaps this will help answer their questions. Conscientiously though we have sought to avoid them, the reader may find errors attributable in part to inaccurate sources and to faulty recollection. To those who may feel themselves wronged, I freely acknowledge that this is in part a book of opinion and that the opinion is my own. In this book I have tried to achieve one purpose: to explain how war is waged on the field from the field command post. For it is there, midway between the conference table and the foxhole, that strategy is translated into battlefield tactics; there the field commander must calculated the cost of rivers, roads and hills in terms of guns, tanks, tonnage- and most importantly in terms of the lives and limbs of his soldiers. How, then, did we reach our critical decisions? Why and how did we go where we did? These are the critical questions I have been asked most often. And these are the questions that gave me justification for writing this book. Military command is as much a practice of human relations as it is a science of tactics and a knowledge of logistics. Where there are people, there is pride and ambition, prejudice and conflict. In generals, as in all other men, capabilities cannot always obscure weaknesses, nor can talents hide faults. To tell the story of how and why we chose to do what we did, no one can ignore the personalities and characteristics of those individuals engaged in making decisions. For military command is as much a practice of human relations as it is a science of tactics and a knowledge of logistics. Where there are people, there is pride and ambition, prejudice and conflict. In generals, as in all other men, capabilities cannot always obscure weaknesses, nor can talents hide faults. During the last six years the United States Army has not only matured greatly, but its officers have grown vastly more aware of their world-wide responsibilities as military men. Allied command has become the accepted pattern of military operation, and many of the insular differences that once caused us to question the motives of our allies have now been completely resolved. During the last six years the United States Army has not only matured greatly, but its officers have grown vastly more aware of their world-wide responsibilities as military men. Allied command has become the accepted pattern of military operation, and many of the insular differences that once caused us to question the motives of our allies have now been completely resolved. If we will only remember that from time to time some difficulties do exist, we shall be better prepared to settle them without exaggerating their dangers. The American army has also acquired political maturity it sorely lacked at the outbreak of World War II. At times during that war we forgot that wars are fought for the resolution of political conflicts, and in the ground campaign for Europe we sometimes overlooked political considerations of vast importance. Today, after several years of cold war, we are intensely aware that a military effort cannot be separated from its political objectives. If a soldier would command an army he must be prepared to withstand those who would criticize the manner in which he leads that army. There is no place in a democratic state for the attitude which would elevate each military hero above public reproach simply because he did the job he has been trained and is paid to do. 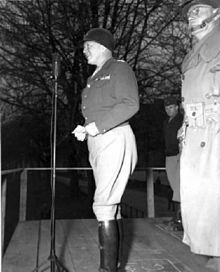 I prefer to remember Patton as a man, as a man with all the frailties and faults of a human being, as a man whose greatness is therefore all the more of a triumph. The Yankee invasion had come to England well heeled with American dollars. American privates earned three times as much as their British companions. A U.S. staff sergeant's take-home pay equaled that of a British captain. Since such a substantial share of this wealth was invested in local courting, it is no wonder that Britain's provincial customs were given a fancy whirl. Indeed, it is a tribute to the civility of the British that they endured us with such good will. "Oh, hell," a sailor grunted, "it's only General Bradley." "But we've got passengers aboard," our skipper shouted through the darkness. "Prisoners?" the deck called; with a note of curiosity. "Stand by to bring the prisoners aboard." I climbed a rope ladder up the Augusta's side and crawled over the rail, cold, wet, hungry, and tired. The crew pressed forward to see its "prisoners". 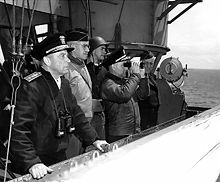 "Oh, hell," a sailor grunted, "it's only General Bradley." There are those who contend that the best strategist is the commander most distantly removed from his troops. From where units exist merely as symbols on a map the strategist can perform in a vacuum and his judgment cannot be infected by compassion for his troops. If war were fought with push-button devices, one might make a science of command. But because war is as much a conflict of passion as it is of force, no commander can become a strategist until he knows his men. Far from being a handicap to command, compassion is the measure of it. For unless one values the lives of his soldiers and is tormented by their ordeals, he is unfit to command. He is unfit to appraise the cost of an objective in terms of human life. To spend lives, knowingly, deliberately- even cruelly- he has to steel his mind with the knowledge that to do less would only cost more in the end. For if he becomes tormented by the casualties he must endure, he is in danger of losing sight of his strategic objective. Where the objective is lost, he the war is prolonged and the cost becomes infinitely worse. But if our afflictions were heavy, we could take comfort in the knowledge that the enemy's outweighed our own. So severe were his losses that none of those divisions committed in the Bulge was ever effective again. 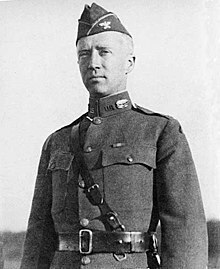 Several days previously I had indicated to Patton that I would feel obligated to ask for relief than submit 12th Army Group to Montgomery's command. George clasped me by the arm. "If you quit, Brad," he said, "then I'll be quitting with you." I walked to the window and ripped open the blackout blinds. Outside the sun was climbing into the sky. The war in Europe had ended. A canvas map lay under my helmet with its four silver stars. Only five years before on May 7, as a lieutenant colonel in civilian clothes, I had ridden a bus down Connecticut Avenue to my desk in the old Munitions building. I opened the mapboard and smoothed out the tabs of the 43 divisions now under my command. They stretched across a 640-mile front of the 12th Army Group. With a china-marking pencil, I wrote in the new date: D plus 335. I walked to the window and ripped open the blackout blinds. Outside the sun was climbing into the sky. The war in Europe had ended. Military hero, courageous in battle, gentle in spirit, friend of the common soldier, General of the Army, first Chairman of the Joint Chiefs of Staff, he embodies the best of the American military tradition with dignity, humanity, and honor. Gerald Ford, remarks upon presenting Bradley with the Presidential Medal of Freedom (10 January 1977). 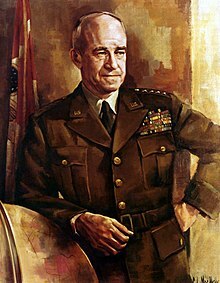 Omar Bradley, on the other hand, would assume a command position in Overlord whose growing responsibilities would reflect the growing preponderance of American strength on the ground, just as Montgomery's role would shrink in proportion to the relative role of the British Army. A steady, self-effacing Missourian, Bradley was as loyal as a subordinate as Montgomery was an aggravating one. Like his West Point classmate Eisenhower, Bradley had never seen combat until he arrived in North Africa in 1942. But he had by 1944 already acquired a reputation, nourished by the worshipful dispatches of war correspondent Ernie Pyle, as "the GI's general"- a persona reflected in the title of his postwar memoir, A Soldier's Story. S. L. A. Marshall, on the portrayals of Bradley and George S. Patton in Patton (1970), in "Great Georgie Redone", in The Charleston Gazette (21 March 1970), § 4. p. 4. Vaughan Monroe, in his 1951 song Old Soldiers Never Die, which was named after a famous speech by Douglas MacArthur.